BANGKOK – On May 10, Myanmar holds a national referendum on a new constitution, a charter which very few of the military-run country’s citizens have actually seen and one which the media and commentators are barred from publicly criticizing in the run-up to the vote. If passed, the charter will move the country into a new political era, though one still firmly controlled by the military. Myanmar‘s military rulers are leaving little to democratic chance, as they apply restrictions and processes to orchestrate a “yes” vote, which by most international standards will not be considered a free and fair referendum. To be sure, without opinion polls, public sentiment is hard to gauge in Myanmar‘s tightly controlled society. The vote significantly represents the first time since 1990 general elections, which military-backed candidates resoundingly lost to the opposition National League for Democracy (NLD), that Myanmar‘s voters will go to the polls. The military famously annulled the 1990 election results and set in slow motion a 14-year process for drafting a new charter aimed at paving the way for new general elections. There are competing interpretations of what the vote actually means. Some analysts believe both rural and urban voters, frustrated by the government’s severe mismanagement of the country, will overwhelmingly vote “no” as an expression of their discontent. “They see it as a referendum on the military government; so expect a resounding ‘no’ from them,” said a Western aid worker in reference to rural voters in the country’s main central rice growing area. “It’s the first opportunity since the 1990 election that they have had to express themselves,” she said. Others view it differently. “I’m going to vote ‘yes’ because I’m tired of the top brass running the country, and doing it very badly,” said a military colonel who wanted to remain anonymous due to concerns over his personal safety. “It’s time to get them out of government and a new constitution is the only sure way of doing that,” he added. “You don’t need to read the constitution to know its simply conferring power on the military for eternity,” said an elderly Burmese academic who likewise wanted to remain anonymous. “The choice is simple – a vote in favor of adopting the constitution means we want the military to play the leading role in politics and run the county,” he said. For its part, the military has repeatedly promised the referendum will be transparent, fair and systematic. Political opposition groups and diplomats, meanwhile, have expressed strong concerns that the results could easily be rigged in the military’s favor. Adding to those concerns is the fact that the general public, not to mention the political opposition, will not be allowed to scrutinize the actual vote counting. A senior general recently told military and government officials in Yangon that only the last ten voters before the polls close would be allowed to stay and witness the actual count. “These last 10 voters who can monitor the counting of the votes by the poll commission members will certainly be members of the Union Solidarity and Development Association, who Than Shwe has given the job of running the referendum and getting the result he wants,” said Win Min, a Burmese academic at Chiang Mai University in northern Thailand. Significantly, international election monitors have been banned from overseeing the vote and it is likely that only a few regime-friendly foreign journalists will be given visas to cover the referendum. Foreign monitoring is essential if the referendum is to have any international credibility, the former United Nations rapporteur for human rights in Myanmar, Paulo Pinheiro, told Asia Times Online in an exclusive interview. Indeed, state-run newspapers are predictably flush with statements endorsing the new constitution. “To approve the state constitution is a national duty of the entire people, let us all cast a ‘yes’ vote in the national interest.” Meanwhile the local media have been forbidden from reporting the “no” campaign, which has been perpetuated on the Internet and by political opposition groups. The government has issued orders banning any criticism of the new constitution and violations are punishable with a possible ten-year jail sentence. Those who have dared to defy those orders have come under physical attack by pro-government thugs and at least twenty young NLD members have recently been arrested for wearing T-shirts that read “Vote No”. The NLD has nonetheless launched a vigorous campaign in opposition to the constitution. “For the people who have the right to vote, we would like to encourage again all voters to go to the polling booths and make an ‘x’ [no] mark without fear,” the NLD urged voters in statement released to the press last week. It nonetheless portrayed the process as a sham. “An intimidating atmosphere for the people is created by physically assaulting some of the members of [the] NLD,” its statement read. International observers endorse that assessment. “The whole process is surreal – to have a referendum where only those who are in favor of the constitution can campaign,” said Pinheiro in an interview. “A referendum without some basic freedoms – of assembly, political parties and free speech – is a farce. What the Myanmar government calls a process of democratization is in fact a process of consolidation of an authoritarian regime,” he said. The new constitution took more than 14 years to draft, a tightly controlled process that excluded the NLD’s participation. The actual constitution was only revealed to the public a few weeks ago and is now on sale at 1,000 kyat per copy – the equivalent of US$1 in a country where more than eight out of 10 families live on less than $2 a day. Even then it’s nearly impossible to find copies, according to Western diplomats who in recent days have scoured the old capital of Yangon in search of the document. Under the proposed constitution the president must hail from the military, while one-quarter of the parliamentary seats will be nominated by the army chief and key ministries under the military’s control, including the defense and interior portfolios. According to the charter’s text, the army also reserves the right to oust any civilian administration it deems to have jeopardized national security. NLD leader Aung San Suu Kyi, meanwhile, will be barred from politics under the charter because she was married to a foreigner, the eminent British academic and scholar of Tibet and Buddhism, Michael Aris, who died of prostate cancer in 1999. Nonetheless, the military is pitching the passage of the new charter as a step towards multi-party democracy, as laid out in the junta’s seven-stage roadmap to democracy. The junta’s second in command, General Maung Aye, recently told a parade of new recruits that the constitution would pave the way for democracy. “Comrades, it is the Tatamadaw [military] that is constantly striving for the emergence of a constitution capable of shaping the multi-party democratic system,” he told the army recruits last week. But even if the junta fixes the referendum’s results in its favor, it will face other major challenges in the run-up to general elections in 2010. That includes the formation of a transition government, which will entail the wholesale sacking of the current military cabinet, many of whom have entrenched business interests protected by their positions. It also in theory must allow new political parties to be formed and freely associate and campaign to contest the 2010 polls. These steps will all likely be delayed substantially if there is a significant “no” vote at next week’s referendum. While the real vote count may never be made public, top military leaders will know whether or not voters support their envisaged transition to a form of military-led democracy. Depending on how the people vote, a negative result could cause Than Shwe and other top junta officials to yet again redraw their political reform roadmap. Larry Jagan previously covered Myanmar politics for the British Broadcasting Corp. He is currently a freelance journalist based in Bangkok. The European Union has renewed political and economic sanctions against the military regime in Myanmar for another year, adding the measures could be increased. The EU’s current sanctions against Myanmar were adopted last October following the brutal crackdown on Buddhist monks who took part in anti-regime protests. The sanctions include a ban on the import of timber, gems and metals from Myanmar, a travel ban and assets freeze on Myanmar leaders and their relatives and an arms embargo. The European Union Council of Foreign Ministers after a meeting in Luxembourg on Tuesday issued a statement calling on the international community ”to adopt similar measures”. The EU ministers expressed deep concern at the situation in Myanmar and again urged the authorities to take rapid steps for transition to a legitimate, civilian government and for national reconciliation. The EU, the statement said, will intensify its close consultations with ASEAN members and other neighbours of Myanmar, including those that are represented in the UN Security Council. The Council said it remained convinced that only a process that involved the full participation of all stakeholders in the country, including Aung San Suu Kyi and ethnic groups, will lead to national reconciliation and stability. ”Thus the Council believes the draft constitution, referendum and elections, as currently conceived, will not address the many problems facing Burma/Myanmar,” the statement added. Burma’s military junta is apparently preparing to seal the country off as popular anger against the regime and the constitutional referendum it plans to hold on May 10 grows visibly in Rangoon and other cities, writes Edward Loxton for The First Post. Foreign journalists who covered the September demonstrations and their aftermath – this correspondent included – have crossed, and continue to cross, into Burma posing as tourists. But Burmese embassies are urgently trying to clamp down on the practice. Even diplomats and UN personnel are being kept waiting for visas, while Ministry of Information officials comb carefully through their applications. “The regime is clearly getting very nervous as May 10 approaches and opposition to the referendum and the draft constitution increases,” said a European diplomat in Bangkok. The junta has every reason to be nervous, according to Bangkok Post writer Larry Jagan, reporting on a wave of demonstrations across Burma at the weekend. In Rangoon, about 20 monks led demonstrators in a march on the city’s Shwedagon Pagoda, central focus of September’s demonstrations. Police herded them away from the site without incident. Jagan, a seasoned Burma commentator, reported major splits within the ruling junta. “Gen Than Shwe‘s immediate subordinate, Gen Maung Aye, is increasingly disaffected with his boss, feeling that he is allowing rampant corruption to bankrupt the country,” he wrote. Last September, Maung Aye was widely reported to be unhappy with the brutal way the regime suppressed the demonstrators. At one point during the crisis, a division of crack troops awaited his order to rebel – but the order never came. We are extremely concerned for the safety of leading democracy activist Min Ko Naing, who is being held in Rangoon¹s notorious Insein Prison. He is suffering from a serious eye infection and may go blind because he is being denied medical treatment. It is reported that his eye condition has deteriorated to the point that he is unable to sleep or eat because of the pain the infection has caused. 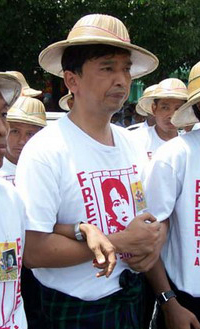 Min Ko Naing has been in prison since August last year. He was arrested for leading protests in Rangoon. The protests triggered the biggest demonstrations in Burma since the 1988 uprising, but were brutally crushed by the dictatorship. We will never know how many were killed during the regime¹s brutal crackdown. Today, the situation in Burma remains as severe as ever. Arrests continue and torture is routine. Political prisoners are singled out for brutal treatment, including the denial of medical treatment. Min Ko Naing is a leading democracy activist and one of the most famous student leaders from the 1988 uprising. He was arrested in 1989 and spent more than 16 years in prison. He was severely tortured and held in solitary confinement for most of his sentence. He was released in 2004 and despite constant threats and harassment by the regime, he has continued to campaign for freedom and democracy in Burma. <http://www.burmacampaign.org.uk/mkn_action.html> and send an email to urge the Burmese authorities to allow immediate medical attention to Min Ko Naing and all political prisoners. By Mizzima News Chiang Mai – Burmese activists on Sunday staged a brief protest outside the Burmese embassy in Bangkok, exhorting voters to reject the ..